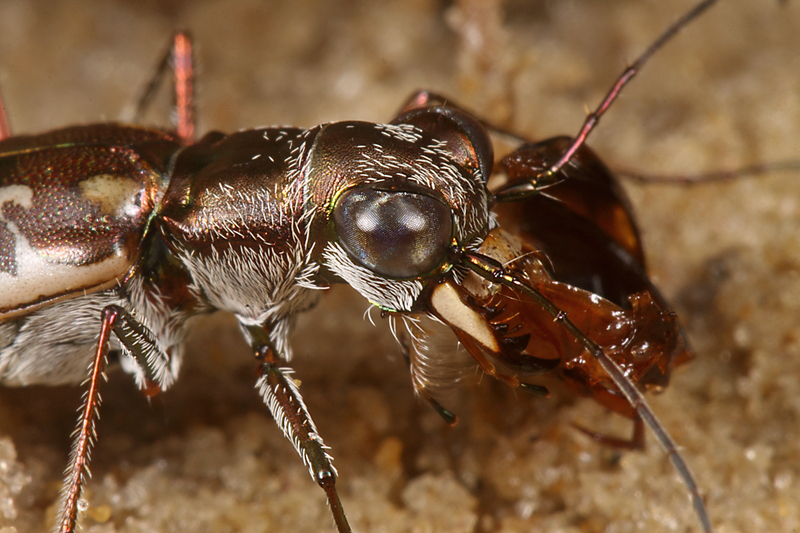 I’ve become a big fan of night-time tiger beetle photography since my early August trip to Florida. Not only does it open up the world of nocturnal species that might go undetected during the day, it also affords the opportunity to see diurnal species engaged in behaviors that are more difficult to photograph during the day. 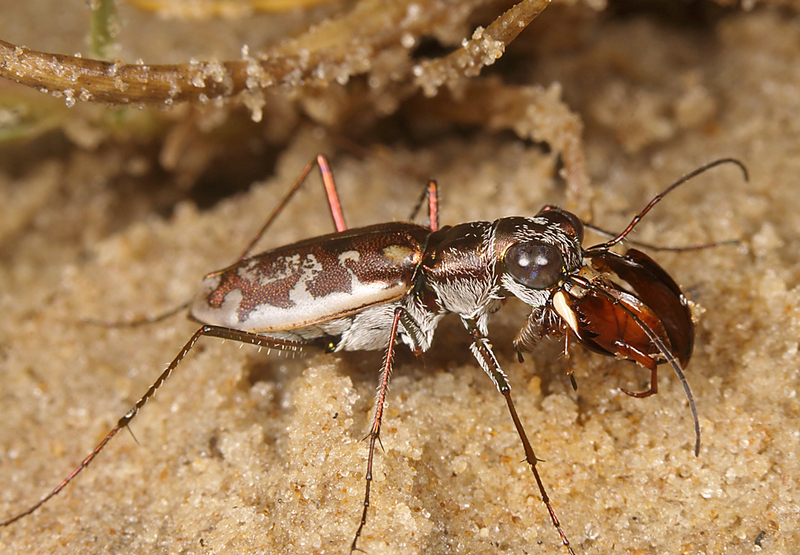 This female Gulf Beach Tiger Beetle (Ellipsoptera hamata lacerata) came to my blacklight at a coastal salt marsh near Steinhatchee and promptly began munching on a smaller beetle that had also come to the light. I didn’t get a good enough look at the prey early on to identify it, and by the time I was able to zoom in big with the camera lens the prey had already been macerated to a crunchy pulp. 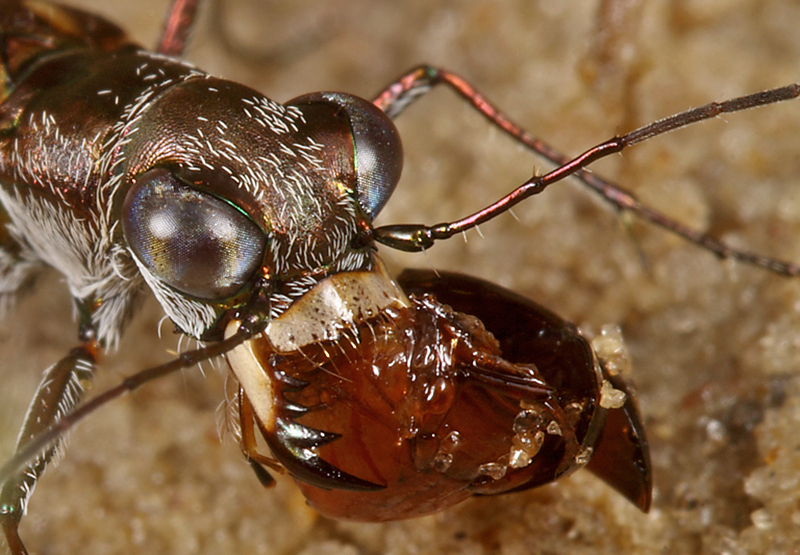 It was interesting to watch the tiger beetle grasp and chew the prey with its mandibles while manipulating its position with its maxillary parts. This entry was posted in Cicindelidae, Coleoptera and tagged beetles, entomology, Florida, insects, nature, predation, science, tiger beetles. Bookmark the permalink. 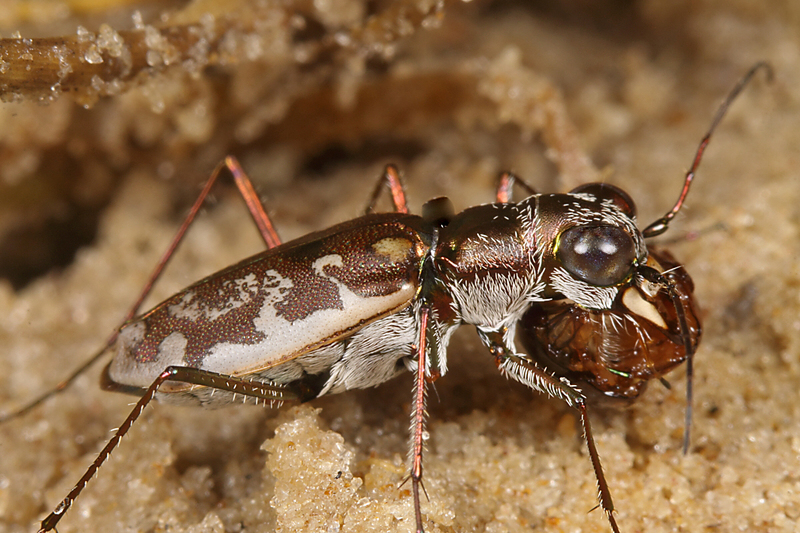 Another fine post – tiger beetles: born to bite! “Born to Bite” – that sounds like a good blog post title! Thanks Javier. I don’t think there are any truly nocturnal tiger beetles in Iberia (the subtribe Megacephalina doesn’t occur in that part of the Palearctic). However, the ability to see these diurnal species at night provides an interesting, different look at them. This is an amazing catch, for both of you! I’m not surprised that they (some?) hunt so efficiently at night, given their large eyes. I especially love the last one with the mandibles in action! I wish I had a video of the mandibles in action – it was quite interesting to watch. Absolutely amazing photos. Wish I had the eyesight to capture such fine details on my macros. PS. Now I know who to refer to (on the rare occasion I photograph strange looking beetles over my side of the world).